Push notifications are known to grab customer attention, but you must tread lightly in order to not tick off your users. Sending out a bunch of advertisements is sure to get your app uninstalled by the average user. So how can you go about writing incredible push notifications that are sure to make your customers intrigued? It all starts with understanding emotions and how customers want to interact with businesses. One of the easiest ways to get people to open up your push notifications is by making your text sound like it’s coming from a friend or family member. Using words like “bro,” “hey,” “sup,” and other slang terms are more than okay as long as your message is relevant, on brand and not trying to trick people. Obviously not every designer and business owner is going to have a bunch of funny ideas on hand. Therefore, we recommend following comedians and funny companies on Twitter and Facebook. You’ll find that your feed gets filled with interesting tidbits that you can adjust to fit your own brand. Reminding customers of holidays and special events throughout the year is a wonderful excuse to either advertise your app or simply help them out with their lives. For example, you might remind people to go out and vote. Election Day is ripe for having promotions when people wear their “I Voted” stickers. Bookmark or follow a calendar website or app that reminds you of all of the official and unofficial holidays coming up. The On This Day website is a good place to start, but you can also find some interesting apps that send out notifications as well. Holidays and special days are excellent for creative push notifications. I’ve seen promotions for the unofficial Beer Drinking Day all over my Facebook page. Other holidays like Earth Day, President’s Day and celebrity birthdays come in handy when thinking up your notifications. Not to mention, these messages can serve as helpful reminders to your users. Coupons and promotions are great, but what about value that doesn’t require you to cut into margins at all times? Push notifications give you that ability, as long as the information sent out is valuable to your core demographic. For example, Uber has been known to send out push notification when surge rates are lowest. This often happens right before a surge rate is expected, urging people to grab their Ubers now, instead of waiting an hour or so. This would work for other booking companies as well. Think about a restaurant. Wouldn’t it be great if you received a push notification from a local restaurant telling you to beat the rush and swing by now? Basically, having the app would remind you to beat the lines before the lunch hour. This would also come in handy if reservations are filling up. Netflix is the king of telling users exactly what they want to hear. They obviously have some algorithms in place to decide on what content each user will like, but I’ve noticed that some of the push notifications are pretty much sent to everyone. 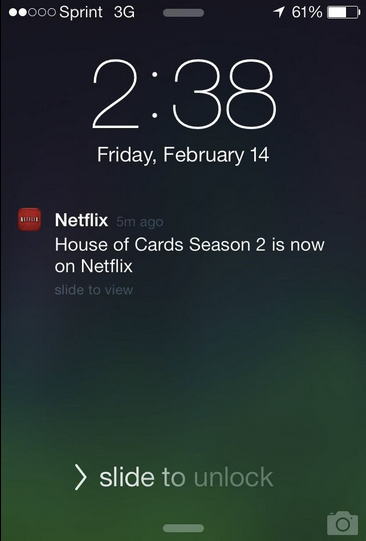 For example, the House of Cards Notification probably wasn’t based on my user activity, seeing as how it’s not even mentioned in my recommended area of Netflix. That said, I’ve heard good things about the show, and it’s always nice to see when new content comes onto the platform. Netflix understands that its customers are looking for new things to watch. They sell TV shows and movies. That’s about it. When it comes to other companies, new, exciting products are more than likely going to get your customers interested. A restaurant and bar might try this with a new menu item. A lawyer might even consider this for a new service being offered. 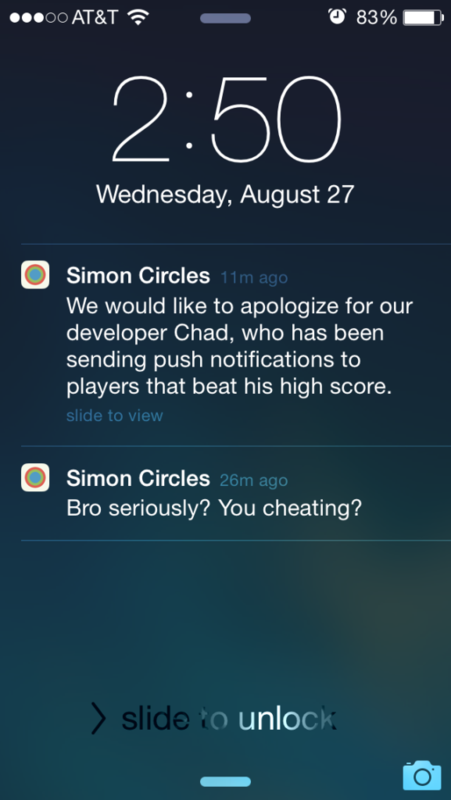 What Strategies Do You Use for Push Notifications? Push notifications are surprisingly fun. They work similar to tweets, but you’re pressured with the fact that customers want incredible value from your messages. So, what are some other incredible push notifications you’ve seen or made? Let us know in the comments.